The Folk Song Society is pleased to present Michael O'Leary-Johns in a house concert on Thursday, October 15th in Newton. Mike comes from Port Talbot, South Wales, but his family roots are in Ireland. His interest in the music started at home, and he learned many Irish songs from his family, especially his mother. He has been involved in the English folk scene for three decades as a performer and organizer, gaining recognition from such singers as the late Joe Heaney. Mike's repertoire comes from all parts of the British Isles, and includes ballads, as well as sea songs, shanties, and mining songs. Over the years, he has sung on his own, as well as with Celtic Sound (an Irish group) and The Motley Crew. 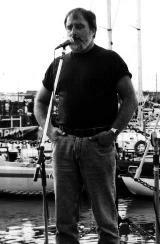 Mike currently sings in the shanty group, Mainbrace, along with Roy Harris and Tony Fraser. They made their US debut in 1997, shortly after Mike and Roy appeared in a concert for the Society. As everyone who heard Mike's big voice at that concert knows, his return visit is not to be missed!